The Khetanna is making its way into homes daily! We thought this was a good time to revive and revamp our listing of figures you can use to populate your barge. We did some homework and compiled a list of characters you’ll need (that have been produced by Hasbro as an action figure already) with your Sail Barge. Click through to see a comprehensive list of existing Hasbro 3.75″ action figures required to effectively populate Jabba’s Sail Barge (The Khetanna)! Hasbro’s store has tons of stuff already on sale and this coupon works on all of it! Crazy that back in July the Mimban Stormtrooper TVC figure hit eBay, and since then, there has been only one store report from Australia that this figure has even touched retail pegs (and they don’t even have Walmarts). Yet, on the eBays, there are plenty available if you want to pay the price. If you’re wondering where on earth this figure is… It’s still in China since that’s where 135 of them has been sold from! Again: Hasbro, you are already killing us with the repacks, at least distribute the few good figures you choose to make! ← TBS6 [P3] Dewback/Sandtrooper For $34.73 + FREE SHIPPING! #populatethebarge - How Is It Going? The Clone Wars are BACK, and so is eBay seller tunghori with Clone Commander Thorn. He has relisted this great clone from The Black Series [Phase II] 3.75″ line for a decent $10.99 each. tunghori Just Added TBS [P2] Darth Malgus! eBay seller tunghori has The Black Series [Phase II] Darth Malgus in stock. Thanks to all who wrote in to let us know! TVC Rey (Island Journey), TBS [P2] Starkiller, LC Jaina Solo + MORE! tunghori has restocked a bunch of great figures, including Rey (Island Journey) from The Vintage Collection. Walmart Exclusive TVC Rey (Island Journey) Listed On eBay Loose! eBay seller tunghori has listed the Walmart exclusive The Vintage Collection Rey (Island Journey) figure. If you’re interested, here is your chance. As you may recall, we reviewed this great figure HERE if you need some persuasion. Thanks to all who wrote in about this new listing. tunghori has ONE Jaina Solo left loose for $49.99. Thanks to JTA reader Craig for the alert! ← GameStop Has Supreme Leader Snoke (Throne Room) For Less Than $15! 3.75" SA Snowtrooper Commander Hits eBay: New Weapon? eBay seller tunghori has added The Black Series [Phase I] Snowtrooper Commander. But what appears odd to me is his weapon. Is that a new gun? It is different than the one that came with the figure a couple of years ago. Could his mean that (A) tunghori goofed or (B) this figure is coming in The Vintage Collection with a new blaster rifle? Special thanks to Greg G. and Scott M. for the alerts! ← TBS6 [P3] Dewback Running Change/Variation? Holy cow. The Gamorrean Guard has finally gotten out in China. Look at this thing. It’s amazing. It will be one of the most sought-after exclusives ever made. I hope Hasbro has a ton in production! Check it out on eBay! Special thanks to Paul B. for the alert! It's Remarkable To See The Aftermarket Spike For ROTJ/Jabba-Related Figures! It’s remarkable how everyone who backed Jabba’s Sail Barge is preparing for its release next February by clearing out eBay. JTA reader Mike R. brought to our attention two figures in particular that have us in awe. 2004’s Star Wars “Saga” [Phase III] J’Quille and Tanus Spijek have been selling like mad on eBay recently. AT any given time you could about two dozen of them for less than $10-$15 each, maybe less. However, they’ve recently sold so strongly that it’s nearly impossible to find any active auctions for them on eBay. If you can locate them, they’re going for a pretty penny. If you recall, we created an itemized list of ROTJ characters while suggesting which one were Sail Barge-worthy, much like how Elaine determines which of her men are sponge-worthy. Well, some readers have taken notice. (You should check out those links again. The increase in prices is astounding.) Don’t wait too long to grab the figures you need to populate this first HasLab offering! Do You Need A Great Slave Leia Figure For Your Barge? If you’re in desperate need of a Princess Leia in her slave outfit for your newly backed Jabba’s Sail Barge (The Khetanna), tunghori has just listed The Vintage Collection’s Princess Leia (Sandstorm Outfit) which also includes the extra gear from the infamous deleted scene. Special thanks to JTA reader Justin V. for the alert. If you need to #populatethebarge, check this link on eBay for the rest! Hasbro: The Sail Barge Is A Shoo-In, Can We #bringbackthesarlacc Now? OK, so it’s “clear” Jabba’s Sail Barge (The Khetanna) is getting fully backed. So what else can we talk about now? I have an idea. Now that 5000+ of us will have a stunning new vehicle for our collection, how about getting on Hasbro’s case to reissue/redo the Sarlacc pit they made years about in 2008’s TLC Battle At The Sarlacc Pit TARGET exclusive Battle Packs release? They could NEVER do a straight repack of it (too many things have been updated since its release), but we’re going to need something to throw Jabba’s prisoners in next! So, how about it, Hasbro? Look how much this “outdated” set goes for on eBay. It’s crazy! See our Research Droids Review on it HERE. An Itemized List Of Figures Needed To Populate Your #backthebarge Purchase! Mr. Evans, good morning, we hope you enjoy your Froot Loops breakfast today. As you indulge, please click through for an urgent request. Rebel Trooper (Hoth) BACK IN STOCK On eBay! The most popular figure from wave 17 of The Vintage Collection that keeps selling out is back in stock on eBay! Grab him if you want him early! Special thanks to JTA reader Jeff M. for the alert! 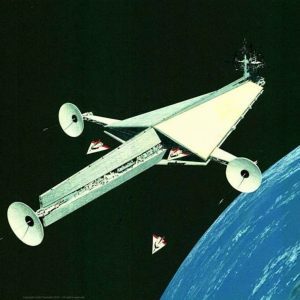 Some images have surfaced of the new line of Hot Wheels Starships from the upcoming Solo movie. Check out eBay Leaks for the story, and share your thoughts in the comments! (Thumbnail stolen from BanthaSkull.com.) We have eleven (11) good reasons why you should INVEST in the HasLab Jabba’s Sail Barge (The Khetanna). If history isn’t any indication that we should, at the very least, learn from our mistakes, I don’t know what is. Click through to see why the $500 backing price is only the jumping off point for where this thing’s value can go. After you click through, click the thumbnails of each previously released TVC vehicle to see the latest aftermarket values. 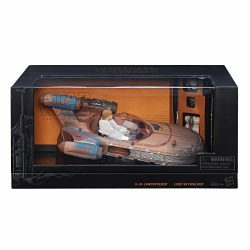 SDCC Luke Skywaker X-34 Landspeeder In Stock At HTS eBay Store! Another SDCC exclusive has made its way onto the Hasbro Toy Shop eBay page. You can grab the Luke Skywalker X-34 Landspeeder SDCC Exclusive right now! Thanks to those who wrote in! Wow! HASCON Exclusive TBS6 Captain Rex Hits eBay: RIDICULOUS BIDDING! Holy mackerel! The HASCON exclusive Captain Rex has hit eBay and look what it’s going for now! Hasbro! This Fenn Rau Nonsense Has Now Become Maddening!! Do you want to throw up in your mouth a little? While that question may be rhetorical, it’s likely what will happen when you looks at what the SWCO exclusive Luke Skywalker (X-wing Fighter Pilot) figure is going for on eBay. I totally never saw this one coming. Ridiculous. Thanks to JTA reader Aldo S. for alerting us to this madness. See active listings HERE and be sure to check out the completed ones too! You’ve seen the clearance at the brick and mortar level start, but now even Hasbro Toys Shop’s eBay store has begun the inevitable ‘clearancing’ out of their latest products. Of note, the Titanium Series 3.75″ figures and even The Black Series 40th Anniversary Legacy Pack have all started on their respective markdown paths. Check it all out. Make Your Best Offer For 50+ TBS6 Loose Figures! Do you want an instant collection of The Black Series 6″ figures? Check out this eBay auction and be sure to make your best offer. Over 50 TBS6 figures await you! Loose Ponda Baba 3.75" Figures 62% Sold Out! If you’re sitting on the fence about securing The Black Series [Phase III] Ponda Baba figure, tunghori has only around 20 left. Don’t wait if you want it! Hasbro Toy Shop’s eBay store still has some great deals and they start as low as $1.50. Be sure to browse the deals as you never know what you might find for dirt cheap! You Think Hasbro Has Deco Problems? Look At THESE Knockoffs! We have posted about this before, but just like many “just seen” inside jokes with close friends, this never gets old. So it’s worth looking at them time and again. Check out these terrible The Black Series (all scales) knockoff figures on eBay.